Eva Rothschild, An Array, 2016. ​303 Gallery is pleased to announce "A Material Enlightenment," our third exhibition of new sculpture by Eva Rothschild. Treating sculpture as a way to mediate simultaneous forms of presence, Rothschild implicates the viewer in a continuous search for possible outcomes, even from within a "completed" work. Rothschild's works frequently occupy the intersection between ritual objects and minimalist formal tradition. Often relying on simple geometric shapes the work engages with these intertwined histories, amplifying the psychological and critical associations they connote. "An Array" (2016) brings together a set of forms from Rothschild's own lexicon. The sculptures, all black and arranged on a low platform, are realized in Perspex, jesmonite, papier-mâché, and steel, and loosely demarcated via open steel frames. 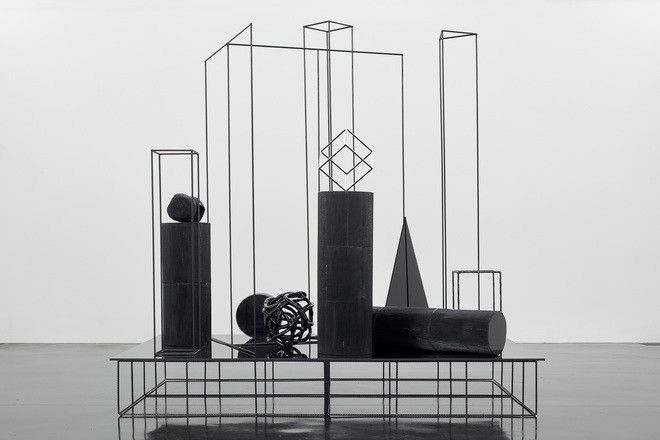 This tableau of objects, with pedestals and partitions acting in diametric tandem, suggests options for various presences and ways of being within a single work in space. The mulitplicity of potential arrangements is both tacit and tangible, as Rothschild's shapes appear on the edge of transposition, yet are beholden to their parameters in terms of a configured artwork. The implicit opening in perception grants the viewer conscious access to the nature of looking, and how an object can vacillate between active and static depending on how and when it is looked at. "Technical Support" (2016) utilizes a similar strategy, but introduces color and material displacement as ways to investigate the additive property of viewership. Jesmonite casts of rolls of assorted tapes are installed in a floor-to-ceiling stack creating a provisional and precarious architecture with suggestions of endlessness. The physical potential of this arrangement is augmented by rhythmic pulses of color and their capacity for amorphous aggregation. Experiencing the work in a 360-degree environment teases out potentialities of cumulative meaning not usually associated with inert materials. Precarious columns and finely balanced structures also figure prominently in Rothschild's mutable objects, with both forms and materials substituted in unlikely places - fabric plinths, cast polystyrene blocks, and beaded knots are all part of the fluid dimensionality of her sculptures. Rothschild's own stools are arranged in the gallery, inviting the viewer to remain longer with the work, promoting a space for reflective re-experience and designating defined viewpoints for works that are more suspended than rigidly materialized.